Want to start from the beginning? Click here for part 1. With a crash, chunks of the wooden arm blocking the exit of the garage we had just come from clattered into the street intersecting the one we’d just run across, and the Rikers’ car roared into the road. It slid across the lanes, slammed into a parked car side-first, then dragged in a door-to-door sideswipe, tires smoking. The police car snaked into a second U-turn and crossed a T in front of the Rikers, stopping in the middle of the road. The Rikers’ car slewed in a panic stop, then reversed into its own cloud of smoke, tires still howling like the damned. Streaks of distortion leapt from the arm of the passenger out over the hood, taking bites out of the side of the police car. The two officers rolled out of the other side of their car, drawing their guns, shouting into their radios. We were forgotten. We bolted behind the chicken restaurant. “How did they know we were there?” I asked. “I don’t know. I don’t understand,” Elvison said. I looked at him in the dim predawn light. “Keep thinking. Let’s head toward my truck in the meantime,” I said. We walked down the alley behind the chicken restaurant, a narrow passage behind businesses punctuated with small green dumpsters. I peered down the next crossing street—blessedly, a narrow one-way lane with no traffic on it—for clues as to where exactly we were. Nothing. I hoped we wouldn’t have to turn around toward the faint wail of police sirens receding behind us. I wondered if they’d catch the carful of Rikers, or if they’d get away. The car chases I saw on the news or on the primetime cop shows never seemed to get away, so I figured probably not. Still, one could scatter from the rest, get away, find us again. I didn’t think it was going to happen soon, but that didn’t mean I could stop looking over my shoulder. And the worry was keeping me from thinking. I stopped behind a fabric store, pulled my phone out of my pocket. It had a map thing on it that I hardly ever used. I entered my hotel’s address. We were only three blocks away. Home free. I could still just barely hear sirens in the distance as the police chased the Rikers. In fifteen minutes, we could be driving away into the rising sun. I kept expecting something to go wrong, but nothing did. We reached the garage, took the elevator up to where my truck was. “I don’t see how. When it’s off, it’s off. It’s not like one of those phones you buy where the company that sold it to you knows where it is all the time. It was built just for this trip, and it’s made to do what it does without being noticed. 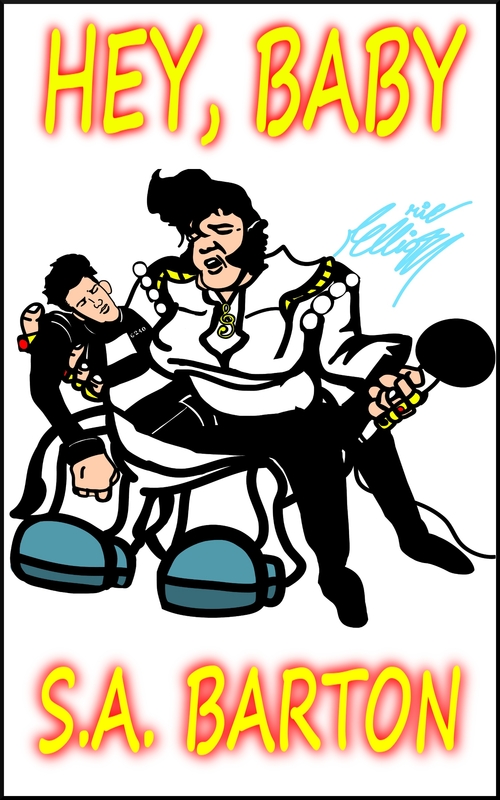 “Yes, Elvison. I’m sorry.” I stuck my hand out, palm up. “Fork it over. I’m not taking you home to meet the wife unless I know those Riker bastards aren’t going to be able to follow us.” He sighed, unclasped it from his neck. Held it over my hand, dangling full length, a thick gold chain in its compressed form, showing no sign of what it actually was. He sighed again. He knew he was wrong, and I was right. It dropped into my hand. I picked a wad of napkins out of the trashcan in front of the elevator buttons, wadded it up, jammed the wad into an empty drink cup and shoved the whole mess into the middle of the night’s trash. The morning janitor would be by any minute to empty it. The sun was coming up on a new day as we drove out of town. We didn’t talk much as we drove, just little bits and pieces as we went past towns and in and out of the states between Nevada and the western border of Kansas, where I decided it was time to stop for the night and get a little rest. Elvison thought we should push on and complained at me until he saw the remaining Rikers on the news, billed by the talking head as a ‘bizarre new California cult’. I wondered how California had gotten roped into the story, but when people talk cults I suppose people think California. They had been apprehended while digging through a dumpster behind the parking garage we’d escaped. “I told you that you were wrong,” I told him. And then I sneezed three times, hard. A wheeze deep in my lungs turned into a cough that turned into a huge wad of green phlegm in a Kleenex from the complimentary box on the nightstand between our beds. I took a few deep breaths, experimentally. There was a rattle forming down deep that I didn’t like at all. I looked over at him, thinking about the people we’d talked to during the day. Fast food clerks. Gas station attendants. The motel clerk. And thinking about some of the things he had said back in the diner. “I think you were wrong about those plague years, too,” I said quietly. “I don’t think we have twenty years. I think you brought it with you.” I could feel the fever sweat springing up on my brow. He leaned over, put a hand against my forehead, sucked air through his teeth when he felt the heat. “I hope you can forgive me. I knew not, baby.” He touched his hand to the empty air over his forehead, to the coif that he’d abandoned in a trash can in the desert. In the end, struggling for breath, squinting to separate vision from hallucination, I told him to leave me behind, to go out and spread his word. Why not? People would need something to hold on to through the coming apocalypse. It might as well be the King. As of this writing, there are forty more of my titles out there to read. You can find them at any of the several sources listed at the top of the right sidebar, under ‘Buy My Books’. Some of them are available for free. Enjoy!